Apologies for a bit of a gap in blogging, but there are a number of reasons (recalcitrant mouse and old computer, got new computer but delay in hooking up, got a virus – me, not the computer! – and being dizzy with the viral infection made me fall, falling cracked a rib – oh, and I’m moving house) so it is a challenge to blog at the moment, but after a week or so me and my computer should be in full working order again!. However the good news – some topics coming up include a look at Bettor’s Delight and his full brother Roll With Joe, and some observations on other “brothers at stud”. What are the pros and cons from breeding, commercial and genetic perspectives? Also I am collaborating with Ray Chaplin of equineexcellence.biz to do some in-depth analysis of Life Sign sons at stud. This follows our previous collaboration on the great mare Rich N Elegant and her sons at stud (see previous blogs). The question in both cases is: Why do some top sons perform at stud and others are flops? That article will initially be published in Breeding Matters magazine (official magazine of NZ Standardbred Breeders Assn) probably in August and then posted on this blog. In the meantime, I will continue to post up my usual range of observations and articles as often as I can. Locally (Cambridge, New Zealand) we are hosting the Harness Racing Jewels event this Saturday, where the top earning 2, 3 and 4 year old pacers and trotters compete over a mile for top stakes in one day of fantastic racing. (2 June 2012). The Jewels is an event that has great memories for me with Tintin In America winning the 4yo Emerald for pacers last time it was held in Cambridge in 2010, the 3yo Emerald in Ashburton in 2009, and placed 3rd in the 2yo Emerald in Cambridge in 2008. It’s also an event the captures the mix of fun day out and intensity of top racing that are the hallmark of The Little Brown Jug and Breeders Crown race days internationally. Well worth supporting – and Cambridge is a really lovely place to visit. Cross our fingers for a fine day – we’ve had some beautiful clear sunny days after overnight frosts this autumn, and one of those on Saturday would be superb. A great sunshiney day and a good turnout at Alabar’s Waiau Pa property. You’d have to be a bigger risk taker than I am to pinhook in the current economic climate, particularly weanlings that are from okay but not recently performing families, and you would need to look for potential to develop into a standout individual over the next 10 months, regardless of breeding. That’s a real gift! 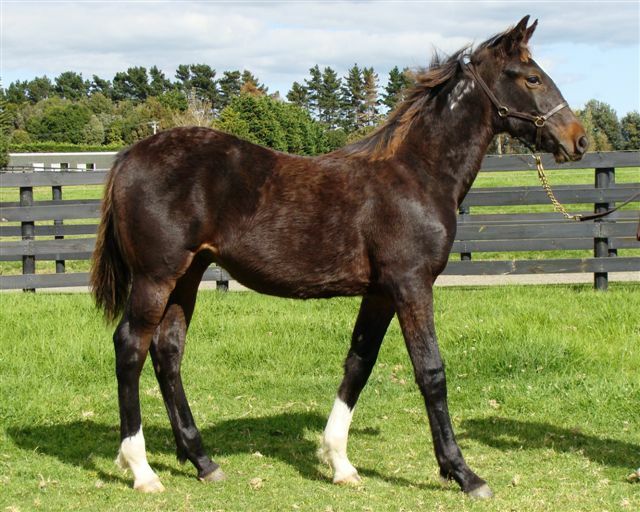 However weanling sales do offer the opportunity for owner/trainers to pick up something at a very reasonable cost and have a go. The cheaper initial cost takes some of the pressure off and gives leeway to let them develop at their own pace. Kym (who has an eye for young horses and their potential that I will never have) has bought three weanling fillies from the Alabar draft over the past couple of years, and all are developing nicely. It was interesting to see their half sisters/brothers as part of this year’s weanling draft. I did my usual first walk around the weanlings “blind” i.e. picking out what appeals on type before I know what the breeding is. I don’t judge on size until I can check the foaling dates, as there were some very early and several late foals in the mix. 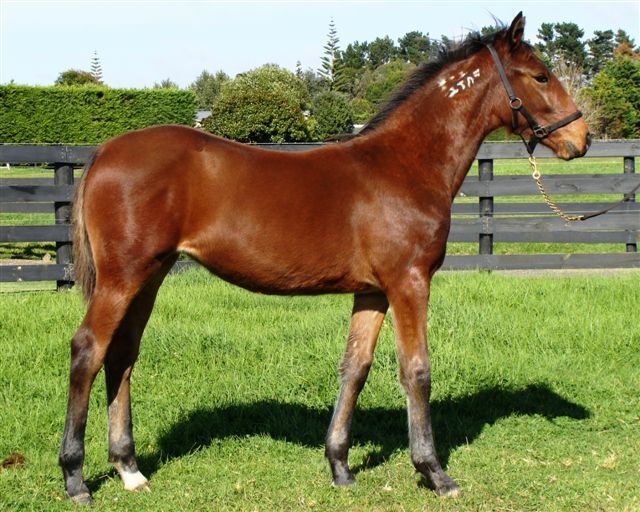 Overall, I came up with number 32, an Art Major filly out of Heather Laurique as my top choice – she’s a December foal and so lacks size but was attractive, nicely proportioned, lovely neck and head. She had a spring and energy about her – an athletic type (photo). I would not normally seek out Art Majors as a personal preference, so it was interesting to find I’d picked her! At the other end of the spectrum in looks, but almost as appealing to me, was number 8, a Real Desire filly out of an American bred mare. A late October foal, she was already showing size and had good strong body and legs, but I reckon she will go through a tall and lanky stage before maturing and probably not a truly early type even though she might get up and running at 2. Compared to 32 she was a plain type, but from the brief encounter I would say she’d have a good temperament. 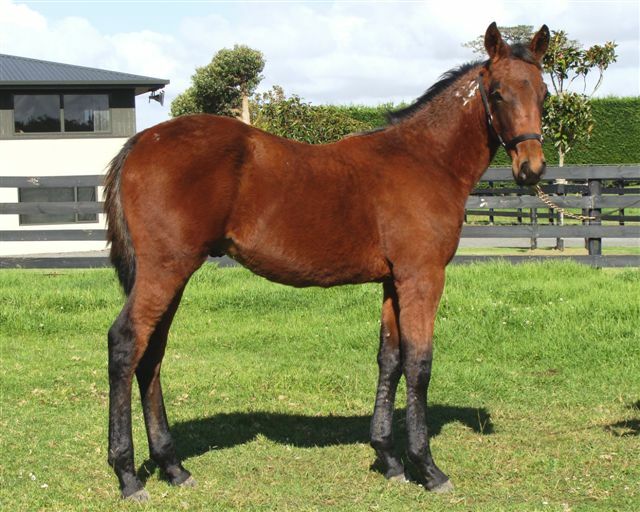 Number 4 is the Santanna Blue Chip filly out of Alta Magari I mentioned in my last blog – she was smaller than I expected although not a late foal – the dam’s influence perhaps, but very correct. Of the colts, I’d take home number 16, a lovely compact but strong looking Grin, and number 21 a Shadow Play out of a Falcon Seelster mare. But there were several colts – and particularly some of the Santanna Blue Chips – that were very appealing. In fact the overall impression of the Santanna Blue Chip weanlings was favourable. I thought they looked good correct types, straight in the leg, decent length of body and upstanding. Shadow Plays were also on my list to check out on type – overall they looked a finer, perhaps athletic type. Not leaping out at me in the same way that most of the Santanna Blue Chips did. Number 25 was a stockier, more solid type and an earlier foal than some of the other Shadow Plays. He has thrown in markings to his damsire Elsu (including a blaze) and perhaps Elsu mares will give a bit more ‘solid body’ to their foals. The sale itself is on this Sunday 20 May when offerings from Woodlands and others will join these weanlings – and of course some mixed aged horses/broodmares. We are not buying this year, and I may not make it to Karaka this time, but I welcome any comments and observations from those who do.